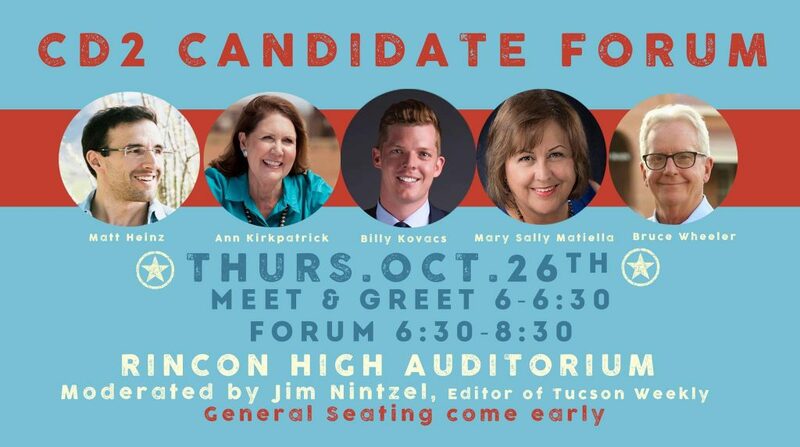 Come join us for a lively evening with the candidates seeking to replace Rep. McSally as the CD2 congressional representative. There will be an informal meet and greet with the candidates starting at 6:00 pm, followed by the candidate forum beginning at 6:30 pm sharp. After the formal part of the evening feel free to engage with the candidates starting at 8:00 until 8:30. Tucson Weekly editor Jim Nintzel will moderate the program for us. No tickets are required for this event. Seating will be on a first come, first served basis. RSVP on Facebook on the Event Page to get updates. Or sign up for our email newsletter!